The Friends of Trigg Bushland are an independent non-profit incorporated group dedicated to the preservation of Bush Forever Site 308, which includes the reserve known as ‘Trigg Bushland’ and adjacent coastal reserves, all of which for the purposes of this submission will be called ‘Trigg Bushland.’ Trigg Bushland consists of 134.6 hectares in total. The Friends of Trigg Bushland were formed in 1990 after several years of informal activity, and do weeding and other maintenance, advise the land manager of issues as they arise, and inform the local community so as to ensure the integrity of the bushland. There are continual development threats to Trigg Bushland due to its prime beachfront location adjacent to one of Perth’s most popular urban beaches. Trigg Bushland is dominated by dunes with Tuart open woodland, except for a coastal strip of shrubland. Tuart with Marri is widespread in the northern section, and there are two very small sections that consist of Tuart, Marri and Jarrah. There are two small Threatened Ecological Communities of Callitris preissii, one in the Tuart open woodland of Trigg Bushland, and the other in the coastal shrubland section of Trigg Bushland. Banksia woodland co-exists with Tuart in many locations, but anecdotally is reduced greatly due to frequent fires. In the whole, Trigg Bushland represents a relatively large tract of Tuart open woodland for an urban setting. Trigg Bushland is predominantly in Excellent to Very Good condition based on Bush Forever data, and predominantly Very Good according to Specterra data in the Trigg Bushland Reserve Management Plan (City of Stirling, Natural Area Consulting 2015, p34). It is likely that Trigg Bushland would be a Category A in the condition classes for Tuart woodlands (Draft Conservation Advice, Oct 2017, p18). Trigg Bushland is an important pocket of Tuarts in a unique natural setting, due to the nested parabolic dunes formed off the cuspate Trigg coast, and needs additional protection from threats. In 2006 the Friends of Trigg Bushland initiated a Tuart Mapping Project in Trigg Bushland. The project was initially spurred by the realisation that the 2003 Atlas of Tuart Woodland on the Swan Coastal Plain identified very few Tuarts within Trigg Bushland, even though the majority of Trigg Bushland is Tuart open woodland. A complete survey of Trigg Bushland was planned, with 10m grids to be walked through the bushland identifying all Tuarts and detailing age, condition and location. The project was combined with a public awareness campaign that included a website (www.triggbushland.org.au) and a noticeboard. Initial results for the Duart Arnott part of Trigg Bushland were completed and presented to the Tuart Health Research Group in November 2008. Nearly half of Trigg Bushland was surveyed, although much of the data remains undatabased; the project has been in recess for several years. In terms of patches (Draft Conservation Advice, p20), Trigg Bushland has very large areas of patches, as can be seen from the attached map of Duart Arnott, which is a very small portion of Trigg Bushland. Although the project was not completed, the initial results for the Duart Arnott part of Trigg Bushland are representative of the whole of Trigg Bushland and resulted in a complete re-think of the management of Trigg Bushland. Many Tuart seedlings and saplings were found, in an area that had been badly burnt in 2001. This indicated that there was a healthy seed bank and that no planting should take place. This was in direct opposition to the position taken by the land manager at the time. Since then, the Friends of Trigg Bushland have recommended that no further plantings take place in Trigg Bushland, and have been largely successful in ensuring that plantings only occur in very restricted areas. The data show that the numbers of trees declines rapidly as they go up in height (expected to be related to age). It is likely that this is due to too-frequent fire, which kills young and even middle aged trees, leaving only the very old trees which can withstand fire – but are prone to age related disease. It would appear that the age of the Tuart population of Trigg Bushland is becoming younger. With fewer mature trees, the seed bank could deplete in areas. Observations of tree shape also give clues to Tuart health. The largest diameter trunks found in Trigg Bushland belong to dead Tuarts. All show signs of fire damage, though the cause of death cannot be known. Most living trees show signs of fire damage (occasionally suspected Tuart longicorn damage) and a large percentage of mature trees have grown into mallee-like forms. An informal analysis of these tree types are attached (and on our website). The Friends of Trigg Bushland have advised the land manager that the major threats to Trigg Bushland are fire, weeds and development/human activity and accordingly have concentrated on these threats, to the exclusion of planting, erosion control and other activities. Concentrating on fire prevention rather than simply re-planting is difficult and is not well supported by the land manager and the fire-fighting community. Although the land manager does not support fuel reduction burns, other than posting arson signage there is no fire prevention strategy in place. Fire-fighting would appear to support de-facto fuel reduction as control times have on occasions been protracted, although that is based on personal observations. Support and strategies for fire prevention are urgently needed for urban bushland, so that they are protected from arson and fire-fighting efforts are swift and effective. Support strategies including public education, fire-fighting education, and effective monitoring of the bushland access to enable offender detection need to be endorsed at a high level before strategies can be implemented locally. As long as Tuart woodlands do not have special protection, it is difficult to convince the relevant authorities that they are deserving of special controls and procedures. 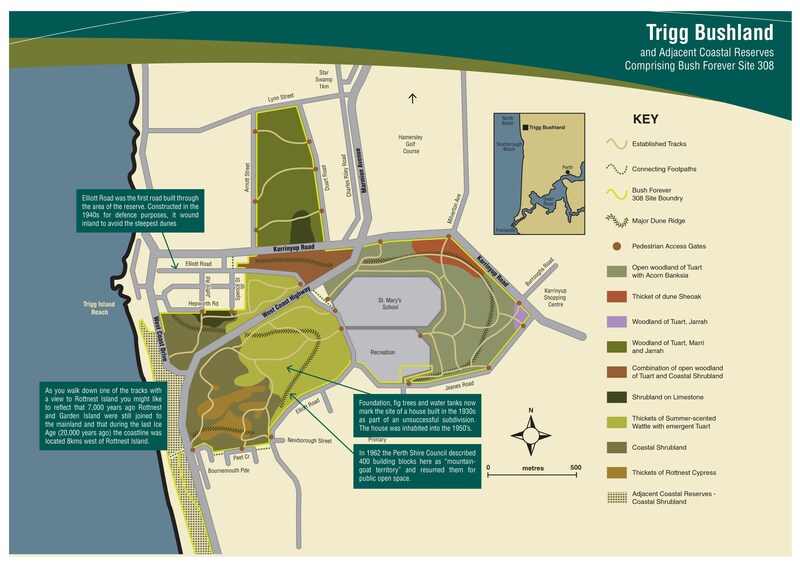 Various development proposals have been put forward by a variety of groups which would impact Trigg Bushland, including playgrounds adjacent to Tuart woodland, walkways through shrublands adjacent to woodlands, and the construction of additional paths through the woodlands. Informal development includes the widespread practice of constructing cubbies and camps in the bushland, including camp fires. Additional impacts flow from the decision of the land manager to allow dogs off lead throughout the bushland (with negative consequences for native animals and plant nutrient load), and not to fence areas that are frequented by orchid hunters and receive heavy off-path foot traffic. All of these human activities result in further fragmentation of Tuart woodlands, as well as the introduction of weeds and opportunities for arson. Protecting Tuart woodland in an urban setting is a difficult task. Although much of Trigg Bushland is Class A Reserve, that is no guarantee that there is protection against major threats to flora. Further legislative protections would create a situation where Tuart woodlands are better understood and appreciated by the public, and efforts to protect woodland can then be more effective and also better appreciated by residents and users of Trigg Bushland. Please contact the Friends of Trigg Bushland should you require any further information.